Kerabu means food that is made from cuts of cucumbers or vegetables seasoned with salt, chillies, etc. Yes, I got it out of the Bahasa Malaysia dictionary. This past 2 weeks have been really hot in Switzerland, and I’m from a tropical country! I barely wanted to cook anything that involved standing in front of the stove. Moreover, I had guests over on Saturday (luckily it was cooler) and cooked butter chicken, so I paired this cold salad with it. It’s very refreshing with just a hint of spiciness. For this recipe, I used some pomegranate because it caught my eyes while I went on my weekly grocery shopping. By the time I was done getting the gem-like seeds out, I looked like I had Unicorn tears all over me (according to the hubby). I made a mistake of wearing a white top. Lesson learnt. 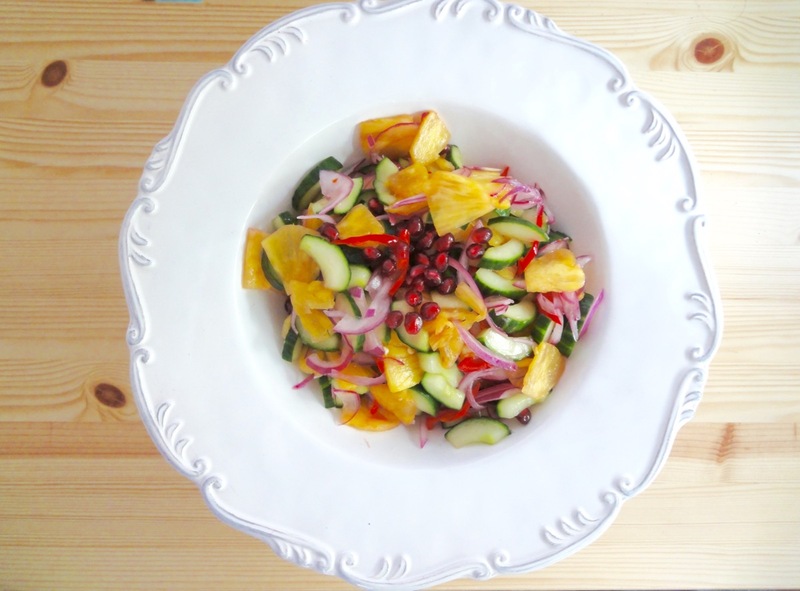 Plus, pomegranate gives the salad an awesome colour boost. Mix limes with sugar and salt. Let dissolve. Combine all ingredients with lime dressing. Chill for an hour, toss it a few times in between.